At SportsHealth Physio we treat a range of foot and ankle disorders ranging from fractures to muscle and ligament tears. However, there are injuries that are more prevalent in the general population and therefore are tended to on a regular basis clinically. 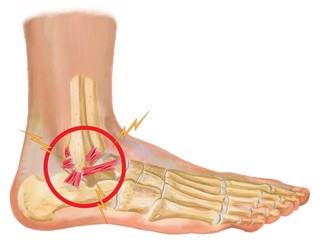 The most prevalent injury to the ankle is an ankle sprain, more popularly called a ‘Rolled Ankle’. Chances are that you may have rolled your ankle at some point in life, specially if you have been involved in sports. However, an ankle sprain is not just limited to the sporting population. Infact anyone is prone to such an injury be it on the footy field, going bush walking or simply while coming down from a step. 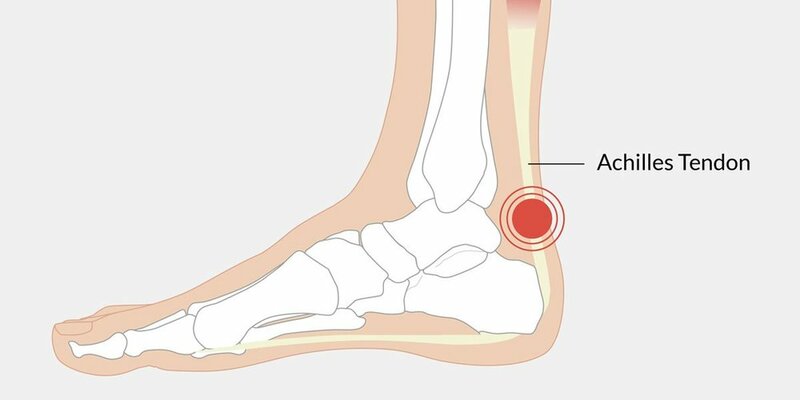 The primary structures involved in ankle injuries are the ligaments and the number of ligaments damaged is dependent on the mechanism and severity of the injury. If force of the trauma is excessive, it causes an avulsion fracture at the base of the little toe which causes the bone to chip away. Therefore no matter what type of ankle sprain you have suffered, it is highly advised to consult a healthcare professional and discuss the optimum course of management to avoid future complications and discomfort. There are instances where ankle injuries are self managed and the lack of pain thereafter keeps one from consulting a healthcare professional. It is important to know that an injury to a joint results in loss of strength, range of joint motion and proprioception. Proprioception is our bodys ability to sense a change in the surroundings and adapt to it, for example when we walk on an uneven surface our foot has to adapt to the surface changes. One of the biggest risks factors for an injury is a previous injury. Therefore if you have suffered from an ankle injury, there is a high chance you may be at a risk of rolling your ankle again. A physiotherapist can help guide you through a structured rehabilitation that involves building strength & improving balanec and proprioception in order to minimize long term issues, one of which is chronic instability and persistant pain. The achilles tendon is the thick band like structure that you can feel at the back of the foot. It is the tendon that extends from the calf muscles and is essential in the biomechanics of the foot. Although the tendon is very strong, it absorbs excessive stress in our day to day life, specially in active individuals. One of the most significant injuries in this area is a tendon rupture which may require surgical intervention depending on the size of the tear. The individual will also be in a ankle brace for 6-8 weeks following the repair in order to promote the healing in the tissue. A structured and supervised rehabilitation program is vital for optimal recovery and returning to work or sports. Furthermore your healthcare professional will guide you on how to prevent a re-injury during the recovery process. There are two management pathways that may be taken for an achilles tear: Surgical or Non surgical. With either pathway taken, an individual will undergo a period of ankle immobilization in a brace or a boot. This measure is taken to ensure proper biological healing of the tendon and to avoid a further tear. However, once mobilization is permited and brace removed, an individual experiences great difficulty in ankle movements. They may also be apprehensive about movements and weight bearing as they feel that the muscle will tear again. This is a normal response following immobilization and a healthcare professional can significantly help to regain joint movement and self confidence. In addition to the range, there are strength and proprioception deficits that will be addressed through an individualized rehabilitation approach. Achilles tendinopathy is a painful condition which presents with a localized painful area at the back of the foot . The condition is common in active individuals who are involved in running. 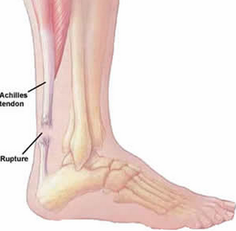 The achilles tendon works while walking, running and jumping which puts it under constant load. Over time, this loading and stretching of this tendon may cause micro damage within it. In addition to being painful, this condition also has a significant effect on our day to day functioning. Typically an individual will experience pain prior to an activity which disappears with activity, only to return once the sport is stopped. Physiotherapists are well equipped to help you manage the condition and get you back to activity. There are a range of interventions including activity modification, load management & eccentric training, dry needling and taping that have shown to aid in the recovery of the condition. The plantar fascia is a thick fibrous band of connective tissue originating on the bottom surface of the heel bone or calcaneus and extending along the sole of the foot all the way towards the toes. The plantar fascia is responsible for limitating the arch in your foot from flattening. Primarily caused by poor foot biomechanics, the plantar fascia develops micro tears due to compression or traction (pulling at the heel) which may lead to it becoming inflammed. This condition is known as plantar fasciitis and the individual experiences pain under the heel or the foot arch in the morning or after resting. This heel pain will be worse with the first steps and improves with activity as it warms up. Plantar fasciitis is reversible and very successfully treated and the majority of individuals improve significantly within two months of initial treatment. Early stages of management involve pain relief following which physios assist individuals in regaining full range of motion. Following pain relief and achievement of full range, patients are taken through individualized strengthening programs to regain arch muscle control and restore proper biomechanics to avoid future reinjury to the structure. Pain felt anywhere along the shinbone from knee to ankle commonly in people who play sports that involve a lot of running are particularly prone to this injury. Individuals typically experience aches and pains along the shinbone. The area will be tender to touch amd the skin may be red and inflamed. The pain may be felt before, during or after running. Shin splints are caused by overstraining of your muscles where they attach to your shin. The most common cause is overuse or overtraining which may be associated with poor foot and leg biomechanics or abnormal movement patterns. Initial management can involve icing the painful area till you can see a healthcare professional. Load management and activity modification is usually the long term management of choice and physiotherapists can help with addressing biomechanical issues that may put you at risk for developing shin splints in the future. Additionally, our injury prevention programs targeted at recreational runners will reduce the risk of developing shin splints in the future.